Geneva – IOM, the UN Migration Agency, reports that 94,676 migrants and refugees entered Europe by sea in 2018 through 21 October, with 45,145 to Spain, the leading destination this year. In fact, since late September’s arrivals were reported, Spain in 2018 has now received via the Mediterranean more irregular migrants than it did throughout all the years 2015, 2016 and 2017 combined. The region’s total arrivals through the recent weekend compare with 146,898 arrivals across the region through the same period last year, and 324,267 at this point in 2016. 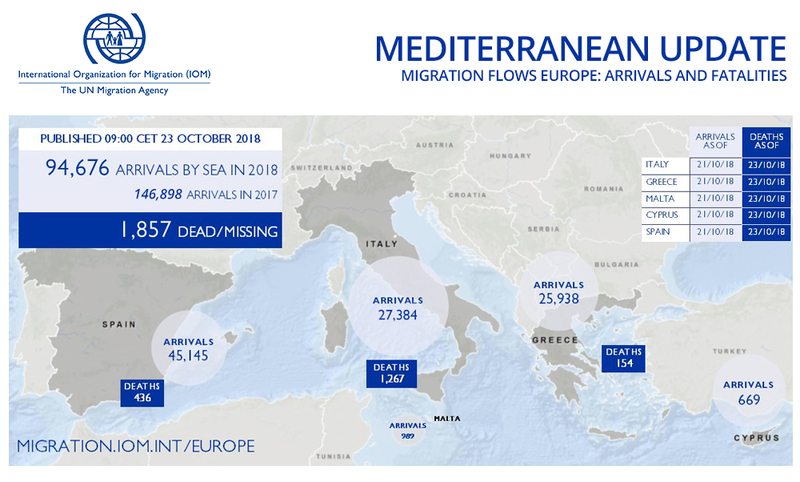 Spain, with 46 per cent of all arrivals through the year, continues to receive seaborne migrants in October at a volume – about 370 daily – that amounts to eight and a half times that of arrivals to Italy and almost three times that of Greece (see chart below). Italy’s arrivals through late October remain extremely low, at fewer than 1,000 for each of the past two months, although with 10 days remaining to be counted in October, totals this month may again cross the 1,000-person threshold. IOM Rome’s Flavio Di Giacomo reported Monday that Ministry of Interior figures released by Italian authorities through October 19 indicate barely half of all sea arrivals this year to Italy by irregular migrants originated in Libya. Di Giacomo said Ministry of Interior numbers through last Monday were 12,465, out just under 22,000 total sea arrivals thus far in 2018. That amounts to 57 per cent of migrant voyages, while around 43 per cent are voyages originating in Tunisia, Algeria and other countries on the Mediterranean coast, including Turkey and Greece. The Libya-to-Italy volume – averaging roughly 43 men, women and children daily through the year – marks a stunning drop in irregular migrant traffic into Italy since mid-summer 2017, when arrival numbers began dropping sharply (see chart below). Volume in 2014 came to almost 450 per day; in 2015 around 410 per day; in 2016 485/day and last year 320/day. Significantly, IOM Libya on Sunday reported that the total number of vulnerable migrants going home in 2018 on Voluntary Humanitarian Return (VHR) flights from Tripoli and other Libyan cities has now surpassed 13,000 – to 32 separate countries of origin – marking the first time on record, IOM has sent back from Libya more men, women and children than the total number of irregular migrants sailing to Italy from that country. IOM Libya said the similarity in numbers does not indicate that every migrant traveling under the VHR programme is a migrant who would otherwise have sailed to Italy. IOM Libya noted increased patrolling by Libyan Coast Guard units who intercept migrants offshore and return them to Libya has had an impact on the number of irregular voyages completed to Italy this year. The Mediterranean remains a lethal passage for migrants, despite the sharp drop in traffic on the deadly central Mediterranean route. IOM’s Missing Migrants Project (MMP) has documented through 21 October the deaths of 1,857 irregular migrants, over two-thirds of those fatalities in the waters between North Africa and Sicily. Most recently, in the Western Mediterranean, the body of a woman was recovered on a beach 40km west of Nador, Morocco, on 20 October. On Monday (22 October) a tragic shipwreck in the Aegean Sea claimed the lives of two children, when a boat carrying 34 people capsized just 50 meters off the coast of Bodrum, Turkey. Seventeen people were rescued from the water by the Turkish Coast Guard, while another 17 made it to shore. Tragically, two of those survivors – both children – died at the hospital, one a seven-year-old girl. Since the beginning of the year, the Missing Migrants Project has documented the deaths of 42 children on the Eastern Mediterranean route, which represent 27 per cent of the total number of deaths recorded on this route. Missing Migrants also reported two people died over the weekend when trying to jump over a border fence between Morocco’s province of Nador and the Spanish enclave of Melilla. Razor wire topping the six-meter border fence caused injuries to several people who were attempting to jump over the fence on Sunday, 21 October. The body of a young man from Sub-Saharan Africa was found on the Spanish side of the border, while local NGOs reported that another man died from his injuries at the hospital in Nador. IOM Spain’s Ana Dodevska reported Monday that total arrivals at sea in 2018 have reached 45,145 men, women and children who have been rescued in Western Mediterranean waters through 21 October. With 10 days left for counting, October is likely to see as many as 10,000 irregular arrivals for the month, which would be the busiest in over four years (see chart below). Dimitrios Tsagalas of IOM Cyprus reported Monday that at least seven migrants and refugees, all Syrians, entered the Republic through the Ledra Palace checkpoint on Friday 19 October, in addition to the arrival of 51 Syrians a few hours earlier at Cape Greco in the Famagusta area. Among these 58 recent arrivals were 27 children. He said these arrivals bring to 669 men, women and children arriving in Cyprus this year, or more than five times the total counted through this date in 2017. IOM Greece’s Antigoni Avgeropoulou reported on Monday (22 October) that from Thursday through Sunday (18-21 October), the Hellenic Coast Guard (HCG) informed the United Nations Migration Agency it was involved in at least 11 incidents requiring search and rescue operations off the islands of Lesvos, Chios, Samos, Symi and Kos. The HCG rescued a total of 349 migrants and transferred them to those islands. Additional arrivals of some 270 to those same islands over these past four days brings to 25,938 the total number of arrivals by sea to Greece through 21 October[GF1] (see chart below). IOM’s Missing Migrants Project estimates that at least 2,962 people died or went missing on migratory routes across the globe in 2018 (see chart below). In addition to the devastating death toll in the Mediterranean, two Venezuelans were reported drowned in the Caribbean, in a shipwreck off the coast of Aruba on 19 October. They were travelling with 17 others in a boat that departed Friday night from the town of El Supí, on Venezuela’s the Paraguaná Peninsula. The remains of the two men were recovered by Aruban authorities, who detained five people. Several others managed to swim to the island. It is not yet known if there are any other passengers missing or known to have survived. Hundreds of people have joined a caravan of migrants travelling through Central America attempting to escape poverty and the threat of violence. As they crossed Guatemala towards the Mexican border, a young Honduran man died in a vehicle accident in the highway Ruta del Pacífico-Amatitlán on 20 October. In a separate incident, six Guatemalan nationals (five men and a woman) died in a car crash in the Mexican state of Chiapas on 21 October. Information on migrant deaths and disappearances in Central America and Mexico is scattered and imprecise, and the deaths documented by the Missing Migrants Project likely only capture a fraction of the true number of deaths.